← Cutting taxes creates jobs: wrong! History shows the exact opposite! 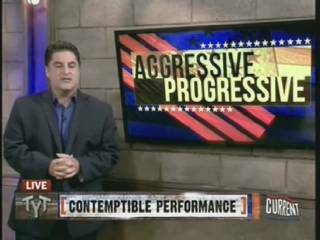 Cenk Uygur: We’re back with the aggressive progressive. As you know, on June twenty ninth the Republicans held Eric Holder, our Attorney General, in contempt. Here’s how it went down. 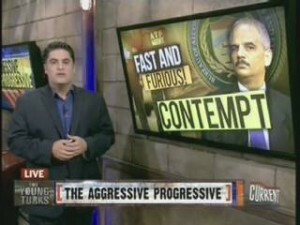 Diane Sawyer: The House of Representatives approved a resolution holding Attorney General Eric Holder in criminal contempt of Congress for refusing to disclose documents on that botched undercover program, the “fast and furious” operation. No sitting cabinet member has ever been held in contempt. Dozens of Democrats boycotted the vote. They walked out of the chamber. 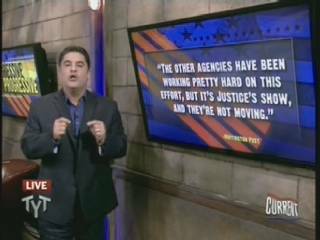 Cenk Uygur: Well, that program was the “fast and furious” that they think he should turn over more information on. But to me the real problem with Eric Holder is not “fast and furious.” In fact we’ve shown on this program that that is nonsense, that the ATF had no program to shuffle guns to intermediaries that then took them to Mexican cartels. 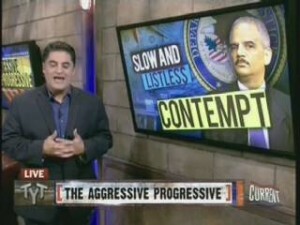 I think the real problem with Eric Holder is what I would call “the slow and the listless”. And that is his treatment of fraud in the banks. We had a gigantic amount of fraud in two thousand and eight (2008). What did he do about it? Nothing. We have the LIBOR scandal now involving twelve different banks. What has he done so far? Nothing. In fact, did you know his former law firm, Covington and Burling, deviced a shell corporation implicated in some of the biggest mortgage and foreclosure fraud? Could that be part of the reason he has not done anything? 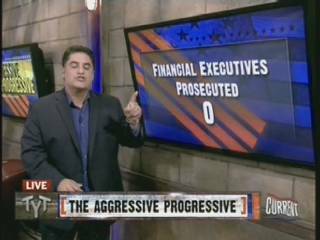 How many prosecutions has Eric Holder done of big bank executives? This is what I hold Eric Holder in contempt for. This is what is unacceptable. And now sources that are talking to Richard Eskow at the Huffington Post say it is the Justice Department that is holding it up, and that they are frustrated, in fact, extremely frustrated, that the Justice Department will not act on the mortgage task force on fraud, and they’re not doing anything about it. That’s what I hold him in contempt for. This entry was posted in Accountants CPA Hartford, Articles and tagged Aggressive progressive, ATF, Attorney General Eric Holder, Cenk Uygur, contempt of Congress, Covington and Burling, Current TV, Diane Sawyer, fraud, House of Representatives, Huffington Post, June 29 2012, Justice Department, law firm, Mexican cartels, mortgage and foreclosure bank fraud, mortgage task force, no prosecutions of big bank executives, Richard Eskow, the fast and the furious, the slow and the listless, The Young Turks, transcript, video. Bookmark the permalink.